In October 1963 Jean Paul Sartre visited Prague as a guest of the Czechoslovak Writers Union and predicted that the great novel of the second half of the twentieth century would be produced by the search for truth about the experiment of communism. Earlier that year, in July, when he was in Moscow for another one of his trips to promote the project of an East-West writers’ community, the Soviet leader Kruschev had initiated a clampdown. At a reception in his dacha in Georgia attended by Sartre, the Soviet leader denounced Western writers as the henchmen of capitalism, a theme reiterated at a conference in Leningrad which castigated Western art and culture for its decadence and corruption. In his Prague visit Sartre confirmed that as a socialist he recognised that they were many unwholesome aspects of Western society but, to his credit, he refused to condone the attack on authors at the Leningrad conference. The writers dismissed as decadent at the Leningrad conference had names like Marcel Proust, James Joyce, Franz Kafka and Sigmund Freud. Jim Holt wrote in a 2003 piece for Slate.com: “In the early 1950s, when the Cold War was at its peak, he (Sartre) realized that he was ‘living a neurosis’; despite his philosophy of action, he had been a mere bourgeois writer, like Flaubert. His interest in Marxism awakened, he decided to align himself with the Communist Party—this at a time when the crimes of Stalin were being documented and other intellectuals were abandoning the party. The erstwhile philosopher of freedom morphed into Sartre totalitaire. Nevertheless, a novel did come out of the communist experiment but Sartre at that time was awake only to the ‘unwholesome aspects of Western society’. The Joke by Milan Kundera is a profound novel with an intricate and beautifully worked out plot. The novel was first published in 1967 in Czech under the title Žert but the English language translations left the author bewildered. It is the loss of many readers that a novel of such brilliance came distorted to them for almost 25 years in four different translations before the author could finally call the fifth English language version as being faithful to his Czech original. Milan Kundera is an intensely private person and he broke a 25-year media silence when in mid-October 2008 he denied an article published in a Czech weekly that on the basis of an old police report said that he turned over a Western intelligence agent to communist authorities in 1950, a move which saw the man narrowly escape the death sentence and led to his spending 14 years in prison. It is a sensitive incident that has been widely reported and misreported and I would need a few days of research before I can comment on it. Milan Kundera was born on April 1, 1929, in Brno, Czechoslovakia, and his first step in the arts began at an early age on the piano. His father, Ludvik Kundera, was a concert pianist and musicologist who had earned recognition for collaborating with the famed Czech composer Leoš Janáček. The influence and the understanding of music can be found throughout Kundera’s works. Kundera was an important figure in the Prague Spring, the brief period of reformist activities crushed by the Warsaw Pact invasion of Czechoslovakia on 21st August 1968. In 1970 he was expelled from the Communist Party for the second time after an earlier expulsion in 1950 had yielded to a readmission in 1956. The second time he was also expelled from the Writers Union and lost his job as a teacher of world literature on the film faculty at the Prague Academy of Music and Dramatic Arts. Access to his work was banned, and Kundera was reduced to making a living by writing an astrology column under a fictitious name. He described that experience in that unforgettable novel The Book of Laughter and Forgetting. Some biographical material even says he worked as a labourer. The Joke is a first person narrative by four characters-narrators and they appear reflectively in each other’s rendition. Armed with just a harmless little prank the novel exposes the brutal and bleak world of a totalitarian system and it does so with a deep understanding of the human condition. It is the power of the story coupled with Kundera’s genius to unearth every human emotion that makes The Joke such a complete delight. At the Fourth Congress of the Czechoslovak writers in June 1967, Czech writers openly clashed with the Communist leadership for the first time. 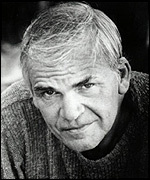 Kundera became a leading figure in the movement for freedom. He delivered a speech that became a milestone in the history of independent, self-critical Czech thought. “Nations tend to think of their cultures and political systems, even their frontiers, as the work of Man, but they see their national existence as a transcendent fact, beyond all question. The some-what cheerless and intermittent history of the Czech nation, which has passed through the very antechamber of death, gives us the strength to resist any such illusion. 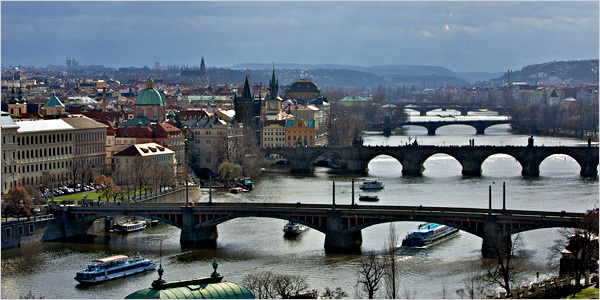 For there has never been anything self-evident about the existence of the Czech nation and one of its most distinctive traits, in fact, has been the unobviousness of that existence. This emerged most clearly in the early nineteenth century when a handful of intellectuals tried to resurrect our half-forgotten language and then, a generation later, our half-moribund people too. Having experienced democracy, Nazi subjugation, Stalinism and ‘socialism’, the Czechs are favourably placed to produce a unique testimony about man and his/her predicament, thus giving Czech culture meaning, maturity and greatness. The question remains, Kundera concluded, whether the Czech national community is aware of this opportunity and whether it will use it. Kundera’s novels offer that unique and moving perspective on human existence. They tell a compelling human story with compassion and with rare insight of a world that is intoxicated with power and oblivious to individual sorrow. Describing irony he says, ‘the more attentively we read a novel, the more impossible the answer, because the novel is, by definition, the ironic art: its ‘truth’ is concealed, undeclared, undeclarable. Irony irritates. Not because it mocks or attacks but because it denies us our certainties by unmasking the world as an ambiguity. In other words, the art of the novel does not lie in the answer but in the beauty of the questions it raises. Sources: Sartre by David Drake; Slate.com, Interview with Philip Roth, writings of Jan Čulík, and the novels of Milan Kundera.